John Ford's "The Searchers" (1956) is in my opinion, along with Sergio Leone's "The Good, The Bad, and The Ugly" the greatest Western ever made. John Ford's camera work and eye for scenery is breathtaking. The script and pacing of this movie is top notch, and there is never a wasted moment. John Wayne's acting in this film is possibly his best performance ever. "The Searchers" truly raises the western to the status of myth. It has a movie whose influence is wide ranging. Just watch the original Star Wars and you will note those vast desert landscapes of Tattooine. You may also note some plot similarities, but I digress. Without any further ado, let's get on with the review. 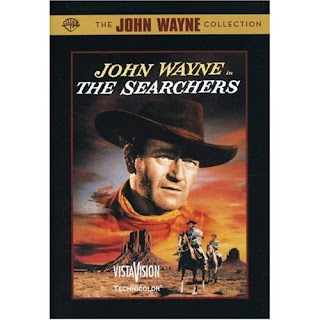 The Searchers takes place a few years after the Civil War, as America is ever expanding into the west, further into the desert. The lurking wild west danger of Indians attacking a a ranch and home has never seemed so ominous. Anyway, Ethan Edwards, played by John Wayne finally makes his way back home after fighting in The Civil War. He has had a very shady and questionable past. Everything is peaceful, with a joyful and bittersweet reunion taking place. Soon we get word of Indians killing some livestock at a neighboring ranch. The men go out on horseback to investigate, but it is a diversion. That evening, under an eerie red sunset, the Indians kill everyone that was still in Ethan's family's house and burn their home to the ground. They kidnap the two daughters of the family, Lucy and Debbie. All of this is done off camera, so the actual horrific events are left to the imagination. All you see is the Indian Chief named Scar, and an ominous shadow as the Indians surround the ranch. Ethan and his nephew Martin Pawley swear revenge and they begin a years long quest to find the two girls and to kill the Indian Chief responsible. The story grandly and leisurely unfolds. This is truly a mythic story of a quest and an epic revenge tale all rolled up in one against the harshly beautiful backdrop of the desert. How their adventure unfolds is something you will need to see for yourself. John Ford has the knack of making such a long quest entertaining and all of the events unfold with a comfortable ease, but there is always an underlying tension. John Wayne as Ethan becomes so obsessed with killing the Commanche tribe and it's leader Scar it is frightening. The look in his eyes alone is enough to make you shudder. His character grows darker and darker as the movie progresses. Do they ever find the two girls? And at what emotional costs? This movie has one of the most powerful endings in cinema. They just don't make them like this anymore. "The Searchers" has so much depth to it, and so much visually to look at it is overwhelming yet simple at the same time. John Ford uses symbolism to great effect. The symbol of the doorway is a great example. The movie starts with a camera shooting through a doorway. Many scenes start and end this way and the movie ends looking out through a doorway. The them song by Stan Jones is also an excellent recurring theme. "What makes a man to wander? But where, oh Lord, Lord where? Ride away, ride away, ride away". The tune is has a depressive, slightly ominous tone to it, and fits the violent quest that unfolds in this movie. Another fine point in this movie is of course John Ford's cinematography. His eye brings the beautiful desert landscapes to life and makes watching them as interesting as watching the characters and the story unfold. I highly recommend this movie. It's hard for me to put how good "The Searchers" is into words. All I can say is if you haven't seen this one, drop everything and rent/buy it now. And if you have seen, well watch it again. I never grow tired of this film. This review or critique has passion but a flaw or two. I'm like this author and love the film and have seen it many times. Lucy is raped and killed, an event never seen in the film. Ethan sees the results of it to the mother in the burning home and prevents Martin from seeing it by knocking him down. Debbie is the only child taken who lives. The theme song poses questions it doesn't answer except to posit the refrain: "Ride away" which is no answer, nor is it what Ethan does. At the end of the film he stays outside but we wish he won't remain there forever.